The ArenaCast host, Damien V, gladly invites you to explore the fifth edition of the ArenaCast mini reviews. This time Damien listened and commented on the LP "Colossus" by British blues - rock band Pearl Handled Revolver, EP "Clearwater Session" and the single "Love For The Loveless" by the Scottish three piece garage\blues rock band Shoogar and to the debut LP "Electric Soup" by the bearded Irish blues rockers Crow Black Chicken. Have a pleasant acquaintance with three brilliant bands featured in the 5-th edition of the ArenaCast mini reviews. 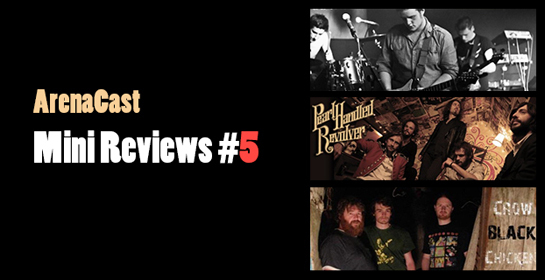 Pearl Handled Revolver — the LP "Colossus"
Five piece blues rock band from Milton Keynes, UK, “Pearl Handled Revolver” let loose their most recent works “Colossus" on Feb 21st, 2012. Enduring with their preceding musical style and once again featuring the supreme gut wrenching vocals of Lee Vernon, “Colossus" grinds forward dusted with the filthy blues they have become notoriously recognized for over their previous few albums. Presenting an indulgent tentative touch with tracks such as “Resonate” and “She Can Dance” showcases the bands multiplicity and a more subtle lighter side. Smokey guitar riffs fused with spiritual organ tones shimmering of the timeworn blues clubs of the Deep South set the mood, supplemented and attractively balanced by the hypnotic rhythm section. “Pearl Handled Revolver” have produced an impressive blues-rock album with “Colossus" and will be assured to delight their most engaging followers, and also support them advance a new platoon of zealous fans. Listen to and purchase the Pearl Handled Revolver`s LP "Colossus" from their Official site. Shoogar — "Clearwater Session" EP and single "Love For The Loveless"
The 3 piece garage blues rockers from East Coast, Scotland, known as “Shoogar” released their debut EP “Clearwater Session” on 1st August 2011, and was enthusiastically followed up with the Single "Love for the Loveless" on 16 April 2012. Opening with a bang, the EP explodes forth with a driving drum fill and is meticulously shadowed by a ball-tearing bass line from Bassist-Vocalist “Neill Beattie”, rhythmically pumping the body of the songs, founding the rock-hard base for the entrance of the dynamic Lead-Vocals of "Chilton Fawcett" to make his mark. Filling the Lead-Guitarist boots “Gavin Rose” comfortably rounds off the sound with his straight forward hard hitting style of Rock-Blues and gargantuan solos throughout the EP..
"Love for the Loveless" follows essentially the same direction “Shoogar” presented with the 3 tracks on their debut EP “Clearwater Session”, and is agreeably keeping true and honest to the bands original flair. Check out and purchase Shoogar`s EP "Clearwater Session" and single "Love For The Loveless" on band Bandcamp page. Crow Black Chicken — debut LP "Electric Soup"
“Crow Black Chicken” from Clonmel, Ireland, formed in 2009 playing as a three piece Blues-Rock outfit, and this year they eagerly unearthed their exquisite debut LP "Electric Soup" proudly onto the marketplace on the 1st June 2012, transporting the live music sensation into the tracks, capturing the true essence of a live gig and producing an open honest sound. Singer “Christy O'Hanlon” deeply growls the bourbon soaked blues vocals staunchly over his powerhouse Blues-Rock guitar licks with assertive ease, leading the charge for Bassist “Steven McGrath” and Drummer “Gev Barrett” to set the pace for the tempo of the songs. Although “Crow Black Chicken” primarily influenced by, and brashly show their allegiance to, the mighty foundation of Blues, within "Electric Soup" they have melded a remarkable musical collaboration inspired by various genres of music including Punk, Jazz, Folk and Modern Rock, and without doubt "Electric Soup" will comfortably find a home in the heart of any serious blues collection.